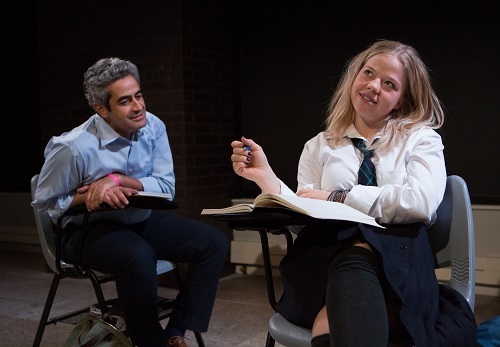 Lo (Dear Mr Wells), a Nightwood Theatre production in association with Crow’s Nest, tells the story of a sexual relationship between a high school student and a teacher. Going into it, I expected the teacher to be a “bad guy”, obviously predatory, allowing the audience to comfortably condemn him. Instead, Mr Wells is a developed character, a likeable human person. I believed that he really did love Lo. That doesn’t at all excuse or justify his actions, but there is rarely this level of nuance in the narrative of sexual assault. Often the stories we hear are either victim-blaming, or the painting of the perpetrator as a monster. The latter has the unfortunate result that when a person is accused of sexual assault, most people think it impossible that someone who seems so “nice and normal” could be that monstrous. This binary thinking — that a person is either innocent or a predator — makes it difficult to prosecute reality, which has many more shades of grey. There is one black-and-white fact in Lo (or Dear Mr Wells), which is that an adult teacher inherently has authority over a teenage student, and that makes all the difference. The acting is terrific from both parties. Vivien Endicott-Douglas’ Lo is the romantically aggressive one, but again with nuance. She is not a seductress, she is not an Oleanna looking for better grades. She is an exceptionally smart girl with some Daddy issues and a very strong attraction to her very attractive teacher. Sam Kalilieh as Mr Wells is very charming in his initial obliviousness to her crush, and very sweet to her during their relationship. He is a teacher who should have known better than to cross that line. A teacher who lies to everyone, including himself. The two switch between in-the-moment acting and past-tense narrative so well that no stage device should have been necessary. This made it distracting that they kept sliding a book across the floor to signify a change in chronology. The framing of the chronologies wasn’t as strong for me either. The conceit is that Lo has shown up at Mr Well’s door ten years later because she’s written a book about their affair. But there wasn’t much emphasis on the book, and the tension that should have been there — that his wife would come to the door, that the book would be published and everyone would know — was very pale in comparison to the tension in the high school narrative, which took up the majority of the play. The set and the lighting were simple and effective. The latter had my attention particularly drawn to it because of a recurring theme of “the almost dark.” I also enjoyed that they had different bags that suited their characters, and which could produce props when needed for a scene. And the fact that the two never left the stage–never, in fact, left off interacting with each other–made the show feel very intimate, as if we the audience were wonderfully, uncomfortably close to these people’s inner lives. Lo (Dear Mr Wells) is a valuable contribution to the conversation about sexual assault and consent, and an enthralling exploration of the dynamic of a relationship that is full of emotion, passion, and an imbalance of power. I listened to it on the Play Me podcast and loved it. I’m still trying to decide whether to see it in person or not. Sort of like a book and a movie. I also listened to it on Play Me, and then saw it last night. Really enjoyed both the podcast and live show. Sam Mooney – you should go !